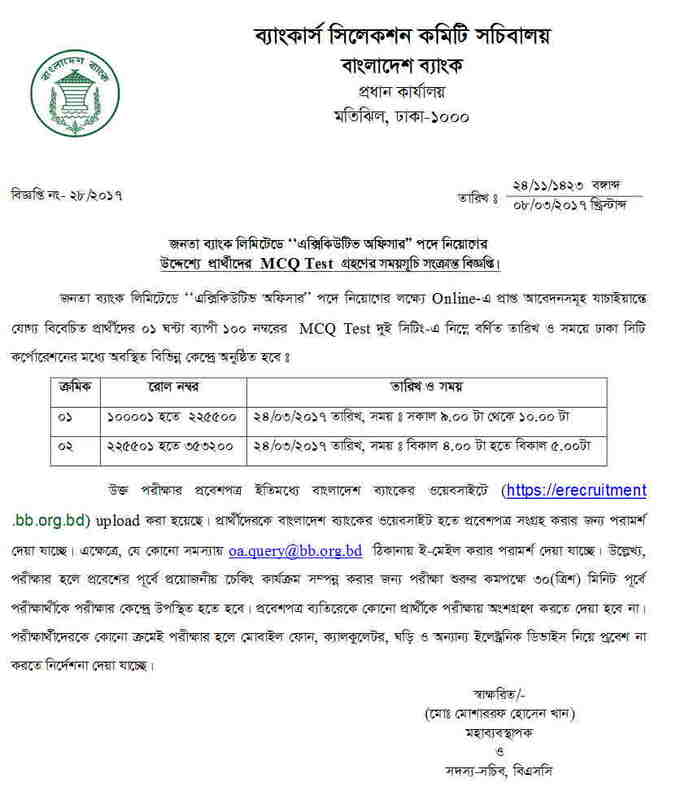 Finally Janata Bank Executive Officer Admit Card Available at erecruitment.bb.org.bd . Download Janata Bank Ex. officer Admit Card from Ejobscircular.com . Tracking Number Start with 171 for the post of Assistant keeper – Display, Communication & Publication of BB and 10005 for the post of Executive Officer of Janata Bank Limited is eligible to download Admit card for MCQ & written test. Janata Bank Limited Job Executive Officer published MCQ Exam Date and this notice also found on my website. MCQ Exam 100 Marks and written Exam 200 Marks examination duration 2 hours. janata Bank Facing three types exam . There is MCQ Test, Written Test and Viva voice test. For More information about Janata bank Job circular and Application process Like us on Facebook and Comment our Facebook Timeline. You can also check Janata bank Job Results from our website. Thanks for Stay with us. This entry was posted in Bank Career, Notice by ejobscircular. Bookmark the permalink.